I share the story of a client who was in that exact situation, and how he was able to go back later and address the issue in a healthy way. I also talk about how you can get a lot done, even when you’re faced with seemingly incessant emergencies. I share about the Law of Solid Ground and how you can use it at work. Tom: I like what John says. He says, “Trust is like change in a leader’s pocket. Each time you make good leadership decisions, you earn more change. Each time you make poor decisions, you pay out some of the change to the people.” All leaders have a certain amount of change in their pocket when they start in a new leadership position, but when you’re out of change, you’re out as the leader. Becoming a Geek Leader, Season Three, Episode Seven. Sponsored by BrightHill Group’s Executive Coaching Services. CEO whisperer, Jerry Colonna, said, “If you’re not consciously, intentionally creating your culture, culture’s gonna get created around you or despite you.” I work with leaders and their team members to help create a positive culture. Sometimes this is by coaching one or more high potential team members to help them develop the skills to create the environment for their teams. Other times, I’m brought in to work with someone who needs help getting back on the path. 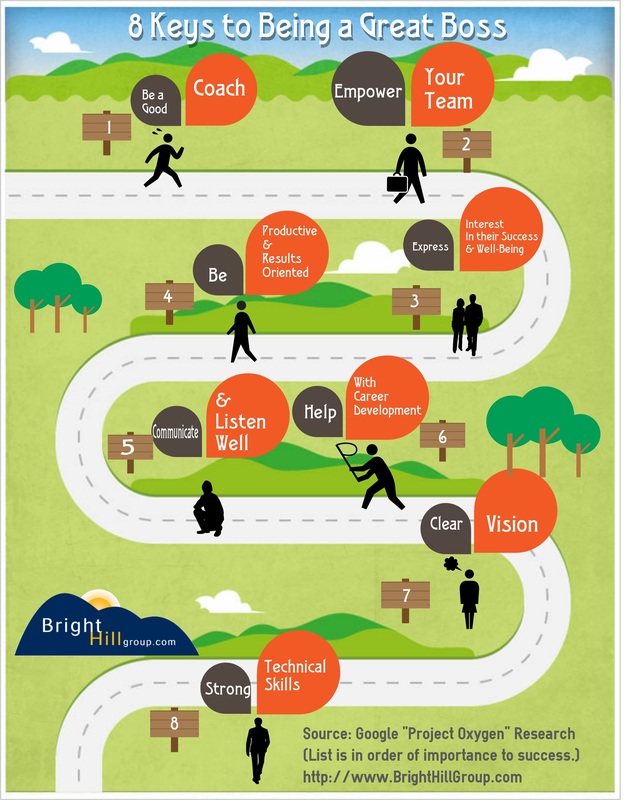 If you’d like help creating a great culture, developing your team members or even taking your leadership to the next level, check out brighthillgroup.com/go/coaching. That’s brighthillgroup.com/go/coaching. I offer individual and small business rates. Let’s get started. Welcome to another episode of Becoming a Geek Leader. In today’s episode, I’m gonna talk about what can you do if you had a conflict with someone a while back. Is it too late now to address it? I’m also gonna talk about how to use your “Big play of the day” to have higher productivity and more accomplishments. And I’ll also be talking about the law of solid ground, how important trust is to high productivity teams. We’ve got so much to cover. Let’s get started. Tom: In today’s Coach’s Mailbox segment, I wanna introduce the idea of something I call your “Big play of the day.” Your “Big play of the day” is a tool you can start to use at level one of the four levels of thinking as a geek leader. Man 1: Level one: Individual. Well, Shelly, that is a common problem. I remember I started a small company a few years back and I quickly noticed a pattern, where there was a crisis almost every day. We’d find ourselves with a bunch of our highly technical people, sitting around the conference room table, discussing what we were gonna do about that crisis. And day after day, I’d go in with an idea about what I hoped to accomplish, only to find that there was something that came up that kept me from getting anything done. It was really frustrating. Now, for us, we eventually found a way to avoid focusing that entire team on daily firefighting. Now, in that situation, I was fortunate to be in a leadership role and I was able to help tackle that. I had some control over what we did. From your email, I don’t get the sense that you’re in a role where you have the formal authority to implement changes at work. But even if that’s true, your “Big play of the day” tool is something you can use to help you make progress towards your goals, even when you have a lot of crises. Now, this idea, the “Big play of the day,” as you look at the things that you want to accomplish, you probably have a long to do list. I know I do. In fact, my to do list is so long that I feel like I’m never gonna accomplish many of the things that are on it and candidly, that may, in fact, be true. But, what I’m suggesting you do is look over that list and identify what one thing absolutely has to happen. What’s one thing on your list that it’s got to happen that day? Maybe it’s an important meeting. Maybe it’s a time sensitive conversation you’ve got to have with another team member. Maybe there’s some project work that if you don’t get it done, there’s gonna be trouble. Whatever it is, I want you to think about that one thing where you need to have clear thinking, where you need to have lots of energy and you’ve gotta be really organized. That one thing is your “Big play of the day.” That’s the play that you need to be ready to hit the ball out of the park. You’re gonna be at your best, at your peak, at your top energy level, ready to go after that thing. No matter what happens around you, you need to save energy, time and emotional strength for that thing. This is the key item on your to-do list. Now, you might have two. You might have two things but you won’t be able to really focus your “big play of the day” if you have more than one or two items on your list. The goal is for you to be able to prioritize the things that are on your agenda so that you can focus your energy and your time and your strength on that thing that’s the most important. Now, this requires that you take the time to prioritize your to-do list. And here’s what’s really interesting about that, when you make the time to reflect and analyze the things that are on your list, it helps you do something really powerful. Even if you only spend a few minutes on this prioritization, on this analysis, it’s gonna unlock performance potential you did not even know you had. Let me give you an example. Let’s say it’s a typical day. On your calendar, you’ve got four meetings and you’ve got a bunch of tasks that you wanna get done. And you really wanna knock about five big tasks off your list, but then at about 10:30, you get called in an emergency team meeting because of a crisis with a customer. And that crisis and the response to the crisis eat up all four hours of the open time on your calendar and you end up leaving the office late, not getting the stuff done that you intended to get done that day. Man, I’ve been there and it is really frustrating. But as you’re looking at that, you’re not completely satisfied with just that one meeting being your big play of the day. So you look at your list and you find item number three on your to-do list. Now, item number three, you think, “That needs to be done. That’s gotta be on my big play of the day also.” Now, it wasn’t number three because it was less important, it became number three on your list because that’s the order you happened to think of it when you were making your list. Your evaluation reveals that task is really important to some other work you need to do later in the week and so you wanna make that your second big play of the day. So now you’ve prioritized those two things, the meeting with the key stakeholder and this task on your to do list. What’s amazing is what happens inside your brain. Now that you’ve identified that those are the most important things that need to happen today, your subconscious mind begins to work on those things even while your conscious mind is distracted or actively working on other things. What you’ll discover is that you’ll have awareness and insights that are made possible by your subconscious mind. Your subconscious mind is gonna bring those things and make them available to you when you need them. That’s gonna help you with being effective at getting your big play of the day done. And even if you get caught up in the team and you’re working on whatever the customer fire is, that we talked about earlier, you’re gonna find ways to make some progress on item number three as well because your subconscious mind is gonna be working on that and helping you to prioritize that. Here’s the thing, when we don’t have clear priorities, when we just absent about clarity about what is the most important, urgent tasks appear to be really important and overall, all of us, psychologically, all of us tend to use time ineffectively. But once we have clarity about the importance of the things we need to work on, you’re gonna find that you have greater focus. Let me encourage you to give this a try just for two weeks. Take two minutes in the morning to reflect on your calendar and your to-do list. Pick just one thing, maybe two, that are just gonna be your big play of the day. Think about the resources you’re gonna need and what success would look like for that specific item. I’m telling you, Shelly, you’re gonna be amazed at how much more you begin to get done and especially what you get done of the most important stuff. So, Shelly, I hope this helps. At the start of your day, or maybe the night before, identify your big play of the day and then intentionally reserve some of your time, some of your energy and some of your emotional strength to make sure you hit that ball completely out of the park when it comes time for that big play. Your big play of the day, that’s today’s Coach’s Mailbox. John: Hello, I’m John Maxwell. As one of my founding partners, Tom has been trained by me and my team. Tom: Today’s John Maxwell Thought Leader segment is all about the law of solid ground. We begin to take advantage of the law of solid ground when we’re at level two of the four levels of thinking as a geek leader. Man 2: Level two: Team member. Level two is where you work well with others and together you all succeed. Tom: John Maxwell says, “Character makes trust possible and trust makes leadership possible.” That is the law of solid ground. Now, this is the fifth installment in the series that I’m doing from John’s book, “The 21 Irrefutable Laws of Leadership” and we’re talking about the law of solid ground. Now, the law of solid ground is entirely about trust. I have to tell you, trust is a reason most of my clients hire me. There’s been a breach of trust, there’s a need for more trust or there’s a disagreement about trust. No matter the circumstances, if there’s a leadership problem there’s almost always a related problem with trust. Now, just last week I was brought into an organization to work with a team to help them create what we called a trust contract, a shared agreement about what each team member can legitimately expect of the other people in difficult situations. High-performing teams have high trust and low-performing teams have low trust. If you want to improve your team’s performance, probably the most effective short and long term area you can work on, is trust. I like what John says. He says, “Trust is like change in a leader’s pocket. Each time you make good leadership decisions, you earn more change. Each time you make poor decisions, you pay out some of the change to the people. All leaders have a certain amount of change in their pocket when they start in a new leadership position. But when you’re out of change, you’re out as the leader.” That is true. People are watching you. They’re watching you in big ways and in small ways and they’re making decision after decision about whether they can trust us, based on the impact our decisions have on them. And here’s the hard part. We judge ourselves by our intent, but they judge us by the impact we have on them. And I’ll give you a quick example. Let’s say you know a project manager expects you to get your part of the work done by Thursday. Now, you fully intend to get it done by Thursday, but then early Thursday morning you get a call from home. Your spouse is sick and you have to leave early. Your intent was good and your values are aligned properly, taking care of family is important. And if you’d been able to do it, you’d follow through on your intent. So you’ve got a good excuse, right? So you cut yourself some slack. But the project manager sees the impact that your actions had on them, not your intent. They don’t see your intent. From the project manager’s perspective, your failure to deliver is just failure. You failed to keep your commitment and that failure erodes their trust in you. So, what can you do to improve the amount of trust that other people place in you? John says that leaders have to demonstrate competence, connection and character. Let’s talk for just a minute about competence. I was working with a client recently who had a team member who expressed significant distrust in my client. And one of the things the team member brought up was his doubt that his boss had the skills to do the work he was doing. I recently read an article from Harvard Business Review called, “If your Boss Could Do Your Job, You Are More Likely to be Happy at Work”. And they reported on research which showed that employees who are confident in the competence of their bosses tend to be happier about their work and they may be more likely to be productive as well. Now, it’s important to be technically competent if you wanna build trust. It is important and that is backed up by Google’s Project Oxygen research which showed that productivity and technical skills rank number four and number eight when it comes to whether employees see their boss as a good boss or not. Bottom line, you’ve gotta know your stuff. That’s what competence is all about. Now, let’s talk for a minute about connection. If you want a trusting environment, people have to believe that you care about them. I think it’s interesting. The same Project Oxygen I just referenced a minute ago, showed that coaching skills, empowering team members and expressing interest in team member success and well-being, all of those placed ahead of competence and delivering results. Think about that for just a second. Coaching skills, empowering team members and expressing interest in team member success and well-being, all more important than competence and delivering results. The connection that you’re making, that connection really matters. And what does that look like? It’s you having intentionality about coaching people through challenges, finding ways to help them feel empowered to make decisions, even without you being around. And then for them to be empowered to take initiative on the decisions that they’ve made, without fear of reprisal or being contradicted. And finally, your taking a genuine interest and concern for them as people, both at work and outside of work. All of those are factors in how connected your team members feel and they’re all components of building that high trust environment. So we talked about connection. Let’s talk for a minute about character. Character is what you do in the dark. Your true character is revealed when you have the opportunity to say something or do something that nobody will ever find out about. Character is what you do. Character is not what you say. Character is the true you. It’s who you are. Other people measure character using only one criteria, Do you do what you say you will do? Do you do what you say you will do? Now, are you a person that people can rely on? I just heard a politician say, “I’m a man of my word” and yet, I’ve observed this politician not fulfill his word in the past. I have some pretty serious questions about the character of the politician and my trust in him is pretty low. So, let me ask you this tough question, do you do what you say you will do? Now, most of us wanna say yes and yet, I think if we’re honest about it, our judgment here is likely to be clouded. We give ourselves credit for having good intent and we don’t count it against ourselves when we fail. People are watching for our competence, our connection with them and our character and those combine to equal the amount of trust they place in us. Our ability to follow through, to do what we say we will do, is a measurement that people are gonna use, whether it’s a big thing or a little thing, to determine how much they trust us. And trust is essential to the law of solid ground. And that’s today’s John Maxwell Thought Leader segment. Tom: In today’s mentoring segment, I wanna talk about how you can go back and address a previous conflict that you’ve had with someone. This is a skill you’ll start to use at level two of the four levels of thinking as a geek leader. Man 1: Level two: team member. Level two is where you work well with others and together you all succeed. Now, that sounds like a pretty rough spot for Steven, doesn’t it? I mean, John cut him off at the knees in front of a client. Steven’s perspective is that it was more than just embarrassment of being called wrong in public, that comment affected the customer’s trust in the whole company as well. That’s some tough stuff. And it’s amplified by time and by distance because if they worked in the same location, Steven could easily have a casual conversation with John in the next couple of days to try and resolve it. But in this situation, it might be months before Steven and John are even in the same location again. And conflict resolution is probably a hundred times harder if you have to do it remotely. It’s just so much easier to resolve conflict face to face. I talked specifically about how to resolve conflict with another team member in Season Two, Episode Four. The episode was entitled, “Dealing with a Disrespectful Team Member.” I’m not gonna go into all the details from that episode here, but I would recommend you go back and listen to that episode for details about how to resolve the conflict. So let’s take just a moment and talk about what can Steven do. The most powerful thing he can do to try and solve this is to be clear and specific. And I often talk about the X, Y, Z technique of conflict resolution. In situation X, when you did Y, it had Z impact. So what I would recommend Steven do in a situation like this is, while the incident is fresh in his mind, you take a few moments to capture the specifics. What room were you in? Who was present? When did it happen? What exactly were we talking about when the conflict occurred? The more specific you can be in your notes, the better it’s gonna be. Because if you end up needing to wait a while before you’re able to have that conversation with that person, you and the other person are probably both gonna need help remembering the specifics, our memories just fade quickly. So, what was the situation? In situation X, what happened? Then, what exactly did John do because when you did Y? So what exactly did he do? And we’re not saying he was a jerk or even he was rude, what specific behavior did you observe? In this case, he called Steven out, directly undermined a statement that Steven had made. And again, we’re not making a judgment about his motivation or coming to a conclusion about his thinking. We don’t know what he was thinking. We’re just factually listing his specific observable behavior. And so we talked about in situation X, when you did Y, it had Z impact. How did it make Steven feel? What was Steven’s observation of the customer and what happened there? You take those notes and you set them aside. You’re gonna be ready to review them when the conversation happens, when you’ve got the time to meet with the other person. So Steven can privately take John aside and say, “John, may I offer you some feedback?” Now, it’s been my experience that John almost universally says yes. And, at that point, Steven’s got an open door to say, “A few months ago when we were working with client PDQ, you remember that meeting we had with Sanjeet, Ralph, and Julia? You said something I wanted to bring up with you.” And then walk through the X, Y, Z technique. 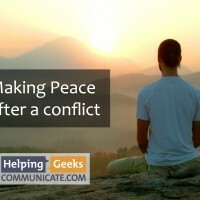 Even if the conflict happened months ago, using that combination of the X, Y, Z technique and “May I offer you some feedback,” it’s a powerful, powerful tool. In fact, I heard back from Steven about this later. He reported that John was very uncomfortable during the feedback. He said, “Tom, I thought he was gonna fall over.” But an hour later, Steven got an email from John thanking him for being willing to communicate a difficult message and resolve that conflict. Taking initiative to resolve an unresolved conflict is a key part of leadership, even if the conflict happened a long time ago and even if we were wrong in the way that we handled it. And that’s today’s mentoring segment. Tom: In today’s episode, we talked about how to get more of the most important stuff done, we talked about how to go back and resolve an unresolved conflict, even if that conflict happened a long time ago and we talked about trust and the law of solid ground. For the Episode Hack, I want you to think about what John Maxwell said. He said, “Trust is like change in a leader’s pocket. Each time you make good leadership decisions, you earn a little more change. Each time you make poor decisions, you pay out some of your change to the people”. Who is somebody you’ve had to pay out some change to recently? What specific action can you take to improve your connection with them? It might be as simple as saying, “Hey, I should’ve made a different call on that one. I’m sorry and I’ll try to do better next time.” And that’s today’s Episode Hack. If you like the podcast, can I ask you to give me a hand? It turns out it’s a big deal to have a rating in iTunes. Now, I’ve heard other podcasters asking for ratings and reviews and I wondered why they kept going after it again and again and again. Do you wanna know? Because almost no one actually does it. It only takes a minute and it’s a huge help. So why is that? Great ratings help iTunes decide that this podcast is worth promoting. And when you put a rating or a review, it helps it appear as a top podcast in the iTunes search. Would you please take a moment to do it right now? There are three simple steps. One, go to the iTunes store, podcasts, two, search for Becoming a Geek Leader and three, give the podcast a great rating. Thanks.